People have been telling me for years how the burger at New Wave Cafe in Queen Village is a hidden gem. However, it just never comes up on my radar while I’m out and about. This weekend though, I had to drop some delicious bourbon off to my friends over at Home Speakeasy/Rock or Neat who live only a few blocks away, so I was ready to indulge in some burger deliciousness. But you know how things go when it comes to friends and whiskey. You decide to stick around and try a little bit, and then a little more, and then before you know it you’re watching YouTube videos and you can’t quite muster the stamina to go to a bar. Well, thank goodness for take-out! Usually I’m skeptical when it comes to ordering burgers for delivery: you never know if they’ll get the order right, toppings could be missing and the burger keeps cooking on the way & you open a styrofoam container and everything’s moist and limp and sad. Since we were only minutes away from the bar, I figured that going to pick it up would be a much safer bet than relying on Grubhub. New Wave’s burgers are 9 oz patties served with lettuce, tomato & onion. There’s also a bunch of other various cheese & topping combinations, but I just kept it simple ordering my standard medium temperature patty topped with cheddar cheese. 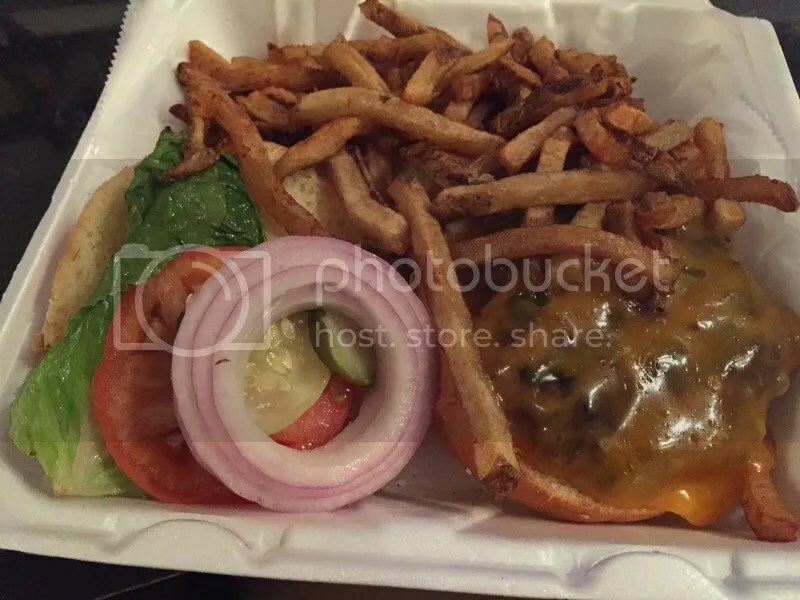 My friend retrieved the burger safely and the presentation looked great for a carry-out container. It was on a soft, seeded bun and the burger was perfectly proportional. On first bite, I saw a pink center and was extremely relieved. The burger itself was tasty and flavorful (even after the 3 or 4 bourbons I’d had that evening). All the toppings were fresh and the cheddar cheese nice and gooey. I was also impressed by how well the fries held up in transit. Still had a little bit of crispy to them and tasted freshly hand-cut. It was a great, fancy bar burger – even if I didn’t eat it in a bar. My only 2 regrets are 1) not having tried this burger sooner and 2) not taking advantage of the variety of toppings. I’ll definitely have to get to the actual bar to check out another burger soon! Posted in bar food, bourbon, buns, burger, burgers, carry out, cheddar, cheese, New Wave Cafe, pick-up, Queen Village. Bookmark the permalink.